Cadenza Storm, better known by her barn name Rain, is a Holsteiner-Thoroughbred mare who is a permanent resident at my stable. Although she has had a somewhat troubled past, Rain has grown into a curious and intelligent young horse. Her favorite hobbies include galloping from the far end of the pasture to the gate, nimbly handling the creek, logs, and other natural obstacles in between, and hiding behind her best pal Mocha after teasing other horses. 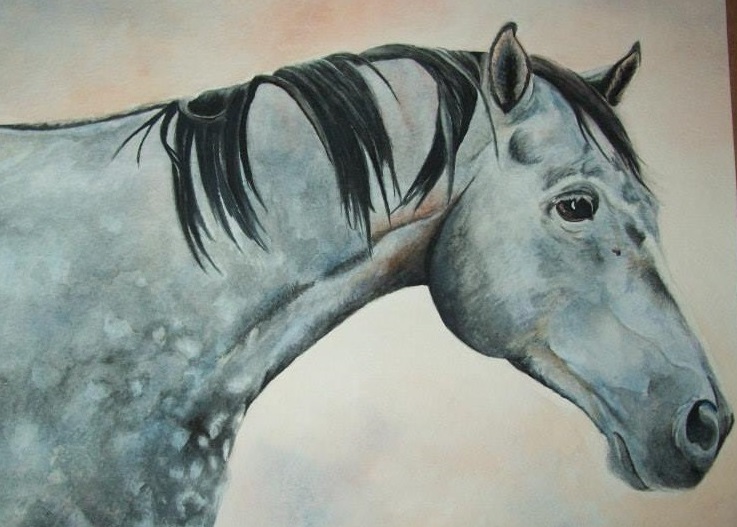 I loved painting Rain because of her unusually dark dapple grey color as well as her finely-molded, thoroughbred type features. True to her sense of humor, Rain took an overly serious approach to being photographed for her portrait, and is doing her attempt at a “Vogue” pose. If you like this painting and would like one of your own animal, I am available for hire! Watercolor Animals Portraits are available for purchase at etsy.com! Sometime around May of 2014 a young female goose waddled onto our farm and made herself at home. For the next four months, “Gertie,” as she came to be known, was a fixture at the barn. Arriving vehicles were greeted with raucous honking, driveways were pooped on, and stock tanks were in ever-present danger if her personal pool was not kept fresh. Alas, as autumn closed in, the difficulties of keeping a lone goose with no real pond to swim in became overwhelming. 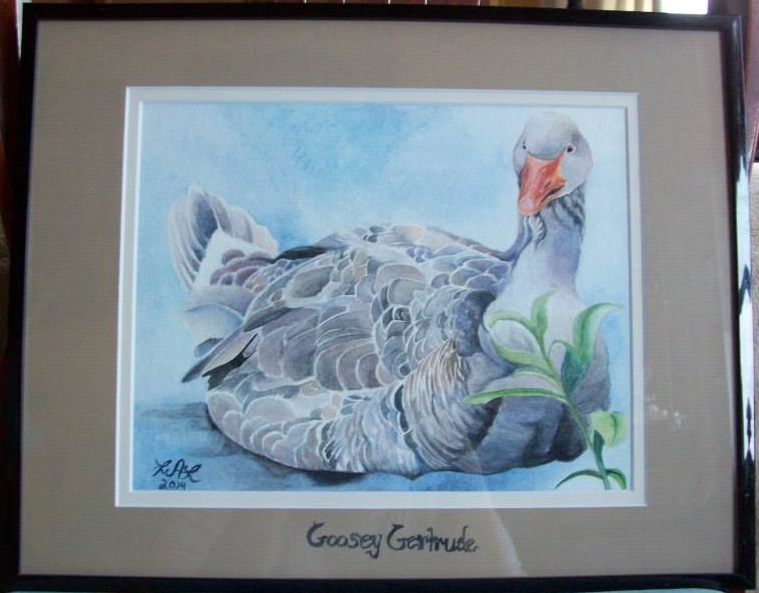 Gertie was transferred to a neighbor’s farm with a large pond and many other geese and ducks to keep her company. To commemorate her stay with us, I painted a portrait of her. As a subject of painting, birds present some fascinating opportunities and challenges. Feathers. A lot of them. It was fun to study the way the feathers folded into her wings and spanned her breast, as was working with her subtle, pebble-toned coloring.